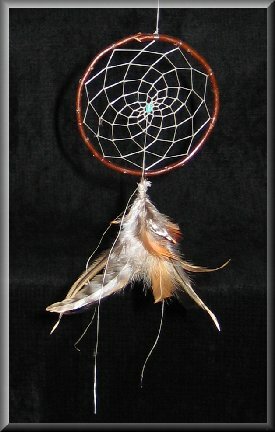 This Dream catcher is an adaptation, using the mid-point weave instead of the end point weave that the original Spider Web uses. It is a beautiful pattern, with the stone in the middle representing the creator or spirit that is at the center of all creation. Each point being in the middle and connecting all things together with a design that overlaps, much like the designs of our lives overlap and intertwine with each other. Our power as a people and as a person, is honoring our connections with all things and with the creator and respecting those connections from a place of love and peace.